The conference promises to be a really exciting and informative event for all people interested in swimming but particularly those of us, who are trying to push the limits of our own endurance both physically and mentally. 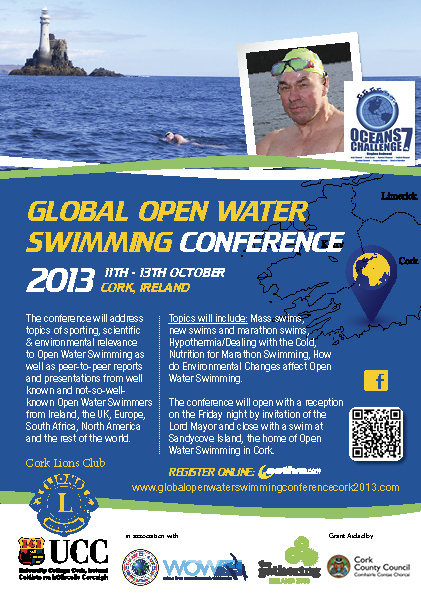 Our speakers include scientists and Open Water Swimmers from around the world with a strong emphasis on Europe. Ice Swimming, the Bering Straits Relay, Ocean’s 7, Triple Crown, the English Channel, the 5 Island Challenge, the North Channel, Jersey Island Long Distance are all swims which will feature highly on our agenda…. Awards will be presented by the International Marathon Swimming Hall of Fame, the World Open Water Swimming Association and hopefully our own Sandycove Island Swimming Club during the conference.